One of the most important inventions of all time, the wheel, was followed by another – the road. Roads were and always will be the backbone of a town or citie’s infrastructure. Ackeem Ngwenya, a student of Innovation Design Engineering at London’s Royal College of Art, noticed an essential flaw in his homeland of Malawi – that being a lack of a road system. His invention reflects this obstacle. An inventive alteration, the ‘Roadless Wheel’ is deemed so because of it’s unique scissor-jack expansion of the wheel’s well. 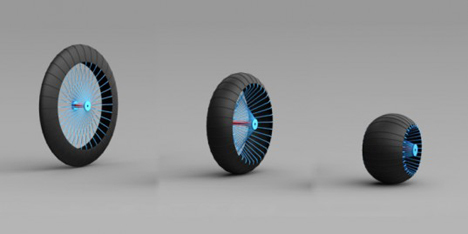 It allows the wheel to stretch or contract, making it more useful and adaptive to harsh driving terrain. In Malawi, Ngwenya grew up on a farm, where he noticed people carrying head loads of fifty pounds or more for dozens of miles – a practice still used today. 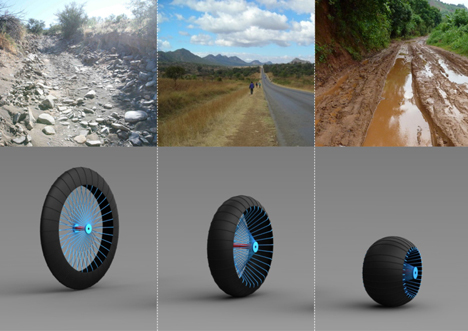 The Roadless Wheel would greatly help this method, and it’s a simpler and more cost-effective improvement to the infrastructure of rural areas of Malawi and other African nations. Help Ngwenya complete his goal and graduate from the RCA through his Indiegogo campaign. See more in Mass Transit or under Transportation. December, 2013.